Elegant and ultra-flattering on any figure, the maxi dress is a go-to for relaxed vacation style. 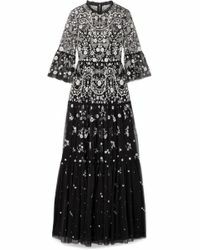 Paired with embellished flat sandals or matched with a statement clutch and platforms, a maxi dress can be worn by day or night. Shop Rachel Rachel Roy's weekend-ready maxis in easy jersey, Issa's floaty chiffon styles and Carolina Herrera's floor-sweeping gowns.